As the weather changes, so too does my preference for wine. And despite the comforts of centralized heating, I’ll nonetheless find myself having fewer white wines and more red. Thomas Jefferson, a fan of French red wine, could not enjoy the benefits of centralized heating. But even with it, I had already began the seasonal changeover to red with a French blend, specifically a Grenache-Syrah-Mourvedre (GSM). GSM grapes are essential components in the well known classic blends of France’s Southern Rhone Chateauneuf-du-Pape, Gigondas and Cotes-du-Rhone wines. But in the curving arc area of France’s western Mediterranean coast – the Languedoc-Roussillon (see map below) – lighter GSMs are made that often offer an easier transition into red wine. 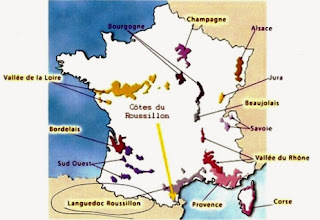 Cotes du Roussillon (the AOC) is the least selective AOC in the Roussillon region. And, like the IGT classification in Italy, can offer remarkable value from top producers. One such producer is Jean-Marc Lafage, maker of Tessellae. The label identifies the blend as 50% Grenache noir, 40% Syrah and 10% Mourvedre. Parker states the blend is 40% Grenache, 40% Syrah, 15% Mourvedre and 5% Grenache Gris (a rare white grape). That would make it only a little heavier on the Mourvedre side and well within (either way) the AOC requirement that red wines must be made from at least three varieties of grapes and with the total of the two main varieties not being more than 90% of the blend. 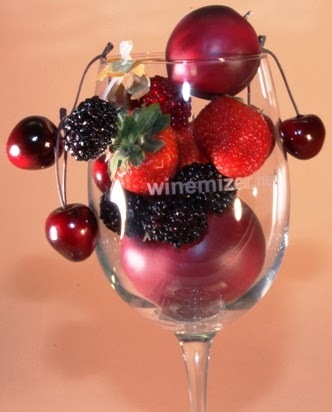 Tessallae is loaded with rich, ripe fruit. Tessellae Old Vines GSM is a fruit bomb and one almost every wine drinker (white or red) can enjoy. The nose offers squashed plum and blackberry and a taste that develops into plum, (and for me) strong blackberry jam and black cherry with a hint of strawberry. It has a soft, velvety mouthfeel due to its soft tannins. This is a soft, easy drinking wine rich in black fruit and a certain crowd pleaser. An excellent “daily” table wine that would marry a duck cassoulet beautifully, but could accompany earthy brie cheese or a charcuteries and olives as well. Tessellae is the entry level label and Domaine Lafage’s least expensive offering. At $12.99, the wine offers great value and an inexpensive opportunity for you to experience (perhaps) new grapes and the expertise of French blending. An Eric Solomon selection and a Parker rating of 93 points for Tessellae tell me I’m not alone in appreciating this delicious value. Drink now through 2017.